Samuel Taylor Bloggeridge: "It is an Ancient Mariner/And he ROCK!-eth one of three ..."
"It is an Ancient Mariner/And he ROCK!-eth one of three ..."
At over thirteen minutes this was, until recently, the longest song in Iron Maiden's repertoire. I'll confess I was never as big a Maiden fan as some of my schoolfriends (Powerslave was released in 1984 man! nineteen eighty four! over thirty years ago! ), but there was no escaping them during my adolescence. And on this track they do the proper Sam 'Metal' Coleridge thing. It's splendid, in its way:—I mean, as an example of its type. I can hardly say that without it sounding condescending, but I don't mean it like that. There are, of course, very evident differences between Coleridge's poem and this song, and not just in the trivial sense that 'the rock song' is a different mode to 'the poem'. Some rock songs capture the sense of a given poem pretty well, after all. This one, though, mismatches Coleridge's original almost completely. It is rapid (it is long, but it is still rapid), urgent, kinetic, driven. Like all Maiden's music it aspires to the condition of violence: noisy, punchy, thrashy, always plunging into the fray. Coleridge's poem is none of these things, with the possible exception of 'violent', and where that is concerned its mode of violence is radically different to Steve Harris's aesthetic understanding of the term. Coleridge is more interested in the obstacles to the mariner than in the mariner's progress; Maiden are more interested in the full-tilt hurtling on-and-on-and-on than in anything that might try to get in its way. Even the song's second section, its tempo slowed almost to languidness, is underlaid by an insistent march of guitar arpeggio triplets. We could put it this way: Iron Maiden, like all rock bands, work to the beat of the hammer on the anvil; Coleridge's poem works like the pull and draw of the oar in the water. ... he reverts directly back to a standard iambic trimeter in the alternating lines (twice, here) to anchor the divergence from the norm. Coleridge's metrical variations, in other words, are there not only to create the ambiance of an old English ballad, but also to generate a vibe of prosodic flow and eddy. and so on. It's a teachable moment, actually, prosodically-speaking. That first line, for instance, swaps out a spondee for one of its anapests, after the venerable Classical rules that permit such exchanges: 'Hĕar thĕ ríme // ŏf thĕ án // ciént má // ĭnĕr [X] // Sĕe hĭs éye // ăs hĕ stóps // ŏne ŏf thrée ...' Looking at it written down, we might expect the first word, 'Hear', to be a stressed syllable; but when you listen you realise that's not the way Dickinson actually sings it. All this is underscored by the duh-duh-DUM-duh-duh-DUM galloping-anapestic rhythm laid down by Adrian Smith's Jackson Dinky. If there's a more serious point in amongst all this (and why can't we take rock and roll as serious, anyway?) it would be the larger contrast, something which points to two quite different aesthetics. 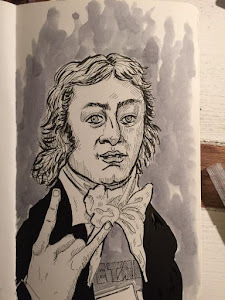 We might put it this way: Coleridge's poetry, as poetry, is more death-drive, always looking for excuses to stop itself; Maiden's music, like all rock, is much more libido, always looking for excuses to keep thundering on. And on. And on.